Meanwhile, many London based bus operators also took the opportunity to demonstrate their strength. A coincidence -- two low floor buses are owned by different bus operators resepectively but both are with Alexander bodywork. 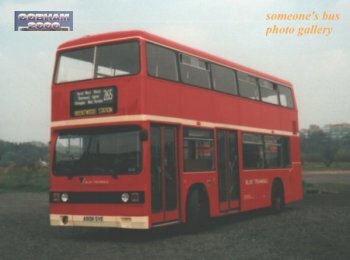 The one on the left hand side is a 9.9m Dennis Trident with Alexander ALX 400 bodywork and it is owned by Connex -- a train operator. The bus becomes London's focus soon after it commences its service. Connex uses this kind of bus to run its first London Transport bus route 3 (Crystal Palace <-> Oxford Circus). 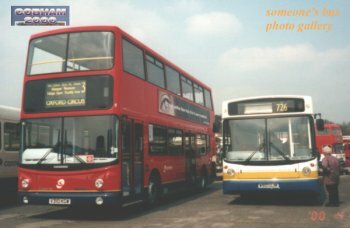 The one on the right hand side is a Dennis Dart SLF with Alexander ALX 200 bodywork and it is owned by Tellings Golden Miller. 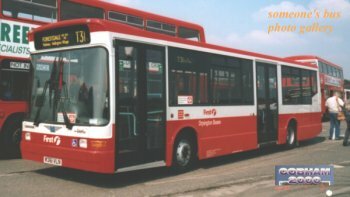 This is a Dennis Dart SLF with Marshall bodywork and is owned by First Centrewest's Opington garage. It looks very smart! Hey, don't just stare at those brand new buses! Take a look at this Blue Trangle's Leyland Titan on the field! Its pose is so nice!